I realize that not everyone has a massive collection of wreaths like we do. But I know that some of you do. Come on, you know who you are. Anyway, in an effort to find more space in our home for our online merchandise, we needed to rethink some of our closets. The obvious choice was where we keep some of our seasonal decor. But it needed to be revamped so we came up with a new system which is super easy and super cheap. We lightly sanded the doors and got any stickers off the fronts. Then we chalk painted the outside. Next, we applied 2 coats of chalkboard paint on the panels. Wait, what? What’s the difference between chalk paint and chalk board paint? Okay, here’s the skinny. Chalk paint is a type of paint that gives a matte, chalky finish. It goes over just about anything and when done right has a really smooth finish. Chalk board paint makes any surface into a chalkboard. As part of the garage- to-Chics With Tools Makery transformation, I decided that I needed a craft paper dispenser. Now, that is not a felt need for most but I use it to cover the tables at my workshops. The thing with really large rolls of paper is that they are heavy, So just hanging a dowel rod on some pegboard was not going to cut it. Ideally, I wanted the unit to hang on the wall. But after pricing that kind, I decided the countertop version would be just fine, as long as I made a wall shelf to hold it. So using all scrap wood, this what I did. This past week we hosted a batch of Chics With Tools Workshops where we painted Easter eggs. I am not talking about the cute little kind but gigantic ones. 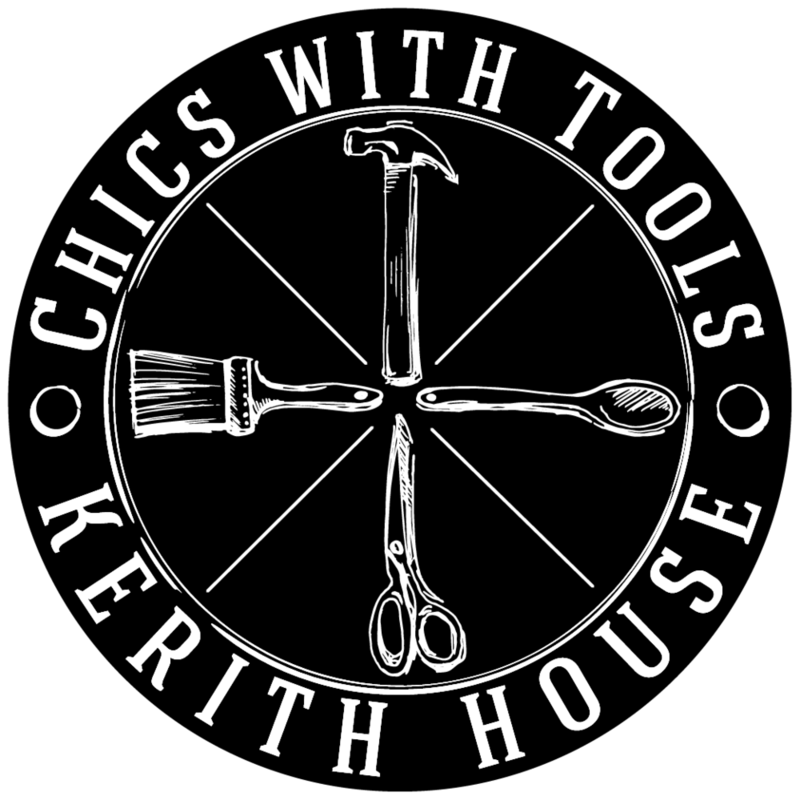 Last week we hosted three Chics With Tools Workshops, “Creativity and Cake”. My enthusiastic participants learned to make ganache, use melting chocolate, make piped leaves, and 3-D roses. Crafting an edible work of art takes time, practice, and, you may be surprised to discover, perseverance. First, the girls learned about carbon paper, which we used to transfer the drawing of the iris onto their boards. Next they mixed some basic shades of the main color they were going to use. Then I took them through the painting, petal by petal. After we got going, the girls became more independent. So by the end, they were doing their own thing. I think some of them were surprised by the results, including the two leaders who exhibited hidden, but significant abilities.